What’s it about? Teenage Sakura’s life is cut short when she’s hit by a truck; next thing she knows, she’s waking up ten years later in a spooky manor full of zombie girls—and she’s one of them! A man named Tatsumi Kotaru tells her he’s gathered them to become a regional idol group that will save Saga Prefecture. With no skills, no training, and most of the group still acting like brainless zombies, it’s gonna be a long haul. 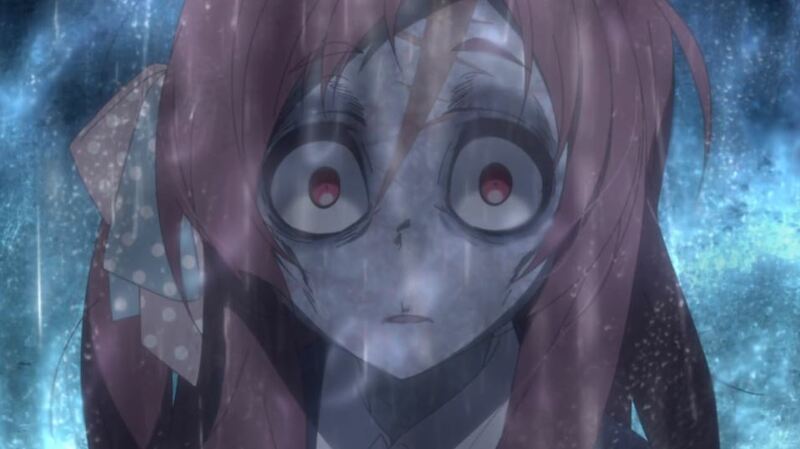 I have no idea if ZOMBIE LAND SAGA is good. But it has my attention—whether that’s because it’s a unique gem or because it’s very loud remains to be seen. This first episode is certainly eager, taking only a few moments to establish its fake-out “first day of school” setup before slamming Sakura, and the audience, with the actual premise. Things never really slow down from there, racing from screaming chase scene to shouty comedic horror to equally shouty exposition and, finally, a screaming death metal performance. It’s a lot to take in. There is something endearing about how the production team’s seeming excitement to show you their COOL WEIRD IDEA, and it held my attention all the way through out of sheer curiosity at what it would do next, but I was left worrying about the staying power of the premise. When a genre gets crowded—whether it’s idols, isekai, or romcoms—there’s a natural tendency for new shows to gravitate toward a gimmick that will immediately make it stand out to a prospective viewer. But a good chunk of those shows then fail to do much with their unique ideas, fading into a by-the-numbers show that happens to have a unique visual overlay. And at the end of episode one, I’m not sure which way SAGA will jump. On the one hand, starting with death metal offers a way to differentiate the show aurally and potentially draw from more countercultural groups like BABYMETAL. The art also at least makes a token effort to incorporate genuine horror elements via the time-honored technique of the grotesque cutaway. If it gets a handle on its comedic timing, it could be a really vibrant draw. On the other hand, the immediately obvious stakes are more-or-less fixed by the end of this episode. All the girls but one have “woken up” and remembered their humanity, and their weirdo manager….owner…necromancer is so skilled at makeup that the girls are completely safe going out in public unless it starts raining. There are more things to do with the zombie angle, but I’m not sure if the show will actually dig into those issues or fall back on more conventional emotional beats. Even the horror is a bit disappointingly half-hearted, afraid to break too far from the overall cuteness and reach the depths of true grotesquerie. The manager, Kotaru, is also a potential problem. His character is a fairly typical “brazen idiot” type here, insisting that his plan will totally work and brushing off both in-universe and meta-textual questions with a heavy, writerly shrug. But this type of character works best when there’s an assertive, self-assured type who can counteract the bluster. Sakura, at least right now, is not that character. She’s too genuinely afraid and eager for reassurance, and it often makes Kotaru come across as a jerk more than a mostly-harmless weirdo. If he’s meant to be a villain that could definitely work, but either way it needs addressed. The fact that he basically owns all these girls and they have nowhere else to go also hangs over things, an unspoken unpleasantness that will only get worse the longer it’s ignored. There’s no fanservice to speak of here, and aside of one unpleasant joke where a concert attendee worries he’ll “get in trouble” when one of the zombies tackles and tries to bite him, it’s surprisingly welcoming in tone. There are a number of places where ZOMBIE LAND SAGA could crash and burn, but the weirdo in me wants to see it continue striding along to its own demented little tune.